The Krems-Wachtberg site during the excavation in 1930, with the jaw of a mammoth yearling (1.5-2 AEY) with removed premolars (MK 1017) to the left, in front of it a fragment of a left fibula from a sub/adult mammoth with spiral fractures and transverse stepped breaks. To the left and to the right of the tusk (MK 1029) two longitudinal trenches filled with ashy sediments were observed (not seen on the photograph). The rounded larger objects beside the tusk are stones. A mammoth’s tusk, discovered during roadworks at the Wachtberg in Krems in 1930, led J. Bayer (Section of Prehistory at the Museum of Natural History, Vienna) to a one-week excavation campaign, documented in his diary and on several photo plates made by L. Adametz. The finds have remained forgotten in the depots of what is now called the Weinstadt museum in Krems until its re-organisation in 1993 which brought about their scientific review at last. The analysis of the diary and the 22 photo-plates revealed impressive settlement-structures, quite similar to the well-known South Moravian sites such as Dolní Vestonice or Pavlov. 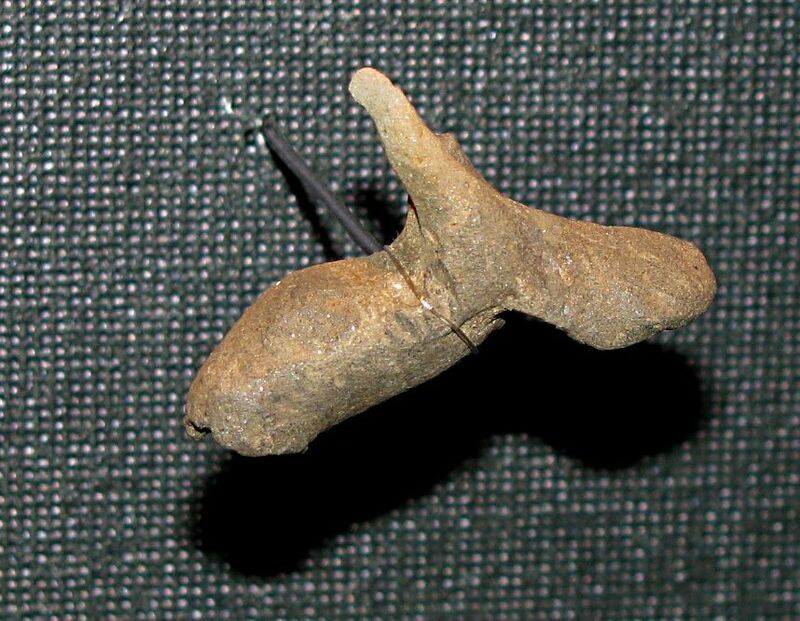 Other such parallels were documented through statistical examination of impact scars from the more than 2 000 stone tools as well as the evidence of animal figurines made of clay, which are the oldest baked ceramics of Austria. Worth mentioning is also the jewellery, which was made up of the fossil remains of marine animals. Considering the examined finds, one older date and two recently taken C14 dates, the Gravettian site would fit into the period of around 27 000 ago, and can therefore be compared with the Pavlovian sites of the Pollauer mountains. It represents also one of the most important reviewed sites in Austria. Saiga Antelope from Wachtberg bei Krems in lower Austria, 27 000 BP, ceramic, original. Formed object with fingernail imprint from Wachtberg bei Krems in lower Austria, 27 000 BP, ceramic, original. A short rescue-excavation in 1930 at a c.15 m2 encampment area recovered remains from at least eight individual mammoths (Mammuthus primigenius), six wolves (Canis lupus), four red foxes (Vulpes vulpes), one arctic fox (Alopex lagopus), three wolverines (Gulo gulo), and single remains from reindeer (Rangifer tarandus), red deer (Cervus elaphus), ibex (Capra ibex), and musk ox (Ovibos moschatus). The body part representation and the bone modification patterns of the species are studied, and the death age profile of the mammoth bone sample is figured. The archeological documentation of the site, the preservation state of the bones, and the evidence of delicate bone fragments support a geologically short-time generated origin of the sample with only light disturbance by carnivores. The remains of at least four calves of suckling age, as well as two subadults, and two adults, at least one bull, may be caused by the exploitation of a mammoth family group. Within the body parts of the juveniles, heads including isolated milk teeth are overrepresented. The osteological patterns of the proboscidean finds indicate the utilization of head, back, and foot parts, as well as long bone and rib internals. Cortical bone fragments were used for works and tools. By ethological analogy the death age profile pleads for a proliferating mammoth population. The second main property of the sample is the extraordinary high carnivore representation, which is over 50% of the minimal number of individuals, and the evidence of their butchering. Under three models about the procurement strategy, the task independent model, the natural co-occurrence model, and the co-occurrence exploiting model, this last one is favoured: The Pavlovian people confronted family herd-units, using any ambush place within the multiformity of the regional landscape, and selectively brought carcass parts back to the residential camp. The prey spectrum and the multiform landscape reflect a variety of potential forage grounds. This and the postulated healthy mammoth herd structure, suggest high yield environmental conditions, and a stable supply position of the Pavlovian people. Site occupation, interpreted from the mammoth calf ages, and from the osteological patterning of the medium-sized herbivore and carnivore carcasses, was probably during the winter months. The contextual occurrence of the zoomorphous burnt clay figurines and the animal parts may reflect a non-subsistential set of human behavior. In 1930 when the site was about to be destroyed, a one week long rescue operation was mounted in order to find as much information as possible about the site, where a mammoth tusk had been discovered. Remains of eight mammoths were recovered, as well as six wolves, four red foxes, one arctic fox, three wolverines, and one each of reindeer, red deer, ibex and musk ox. The sample showed that these remains were all formed within a very short space of time. The age grouping of four suckling calves, two young adults, and two adults, with at least one bull, show that we may be looking at a case where a complete family group was hunted and killed. This age grouping means that the mammoth population may have been increasing rapidly at this time. It is also interesting that there are so many carnivores represented, as well as evidence of their butchering. It seems likely that the hunters encountered or hunted a complete family group in an ambush, and having killed all members of the group, brought the most useful parts of the carcases back to the camp. Further, it seems likely that the area was a rich one in terms of forage for the mammoth group, and the hunters would have had a large number of such family groups to choose from. It seems likely that the mammoth family group and the carnivores were hunted during winter occupation of the site. Body-part representation of mammoths (shaded). Numbers in parentheses indicate the minimum number of individuals counted on each element. Short arrows in bold face: impact marks. Long narrow arrows: cut marks. White arrows: breakage probably resulting from a heavy blow. Outline after Mol & Essen (1987). The Krems-Wachtberg site is on an exposed south easterly slope, at an altitude of 260 metres above sealevel, within a cluster of similarly aged sites. It is a hilly area, and has ridges starting at an altitude of 500 metres, and the hills go up to around 1000 metres. The valley floors are at around 200 metres. By chance in the summer of 1930, during road works, mammoth bones were discovered within the loess sediments, and a short rescue excavation was mounted. The site is only 15 sq. m in extent, and within this area there were two ditches of around 30 cm in depth filled with ash. There were two zoomorphic burnt clay figurines discovered, the only such in Austria. There were 2 300 stone tools found, including 70 tools and 500 bladelets. The stone artefacts show a strong resemblance to those from Dolni Vestonice and Pavlov, about 100 km away. The bone sample consisted of about 340 pieces and fragments. The bone surfaces were corroded and destroyed by root etching, from grasses and shrubs and trees which absorbed nutrients from the bones. This has meant that only the deepest parts of cut marks made by humans were preserved. There were more mammoth remains than anything else, and heads, as well as single teeth, represented up to one quarter of the bones. The bones have been given an age of 27 700 to 27 100 BP. Most of the cut marks were on the ribs. There were many impact marks showing the splitting of the large long bones of the mammoths. Cut marks are concentrated on rib surfaces. The thin outer layers of leg and rib bones were preferred for making into tools. It appears that the carnivores were used for both their fur and their meat. During a rescue-excavation undertaken in 1930, 219 identifiable bones from at least eight mammoths, six wolves, five foxes, three wolverines, two reindeer, one red deer, two ibexes, and one musk ox were uncovered. Three AMS-dates from charcoal indicate a 14C-age of 27 700-27 100 BP. Mammoth remains dominate the total bone count (141). The presence of four very young calves argues for a proliferating mammoth population. The skeletal representation pattern provides evidence for the transport of all butchering units, at least from the carcasses of the calves, from the death site. Cut marks are concentrated on rib surfaces. Multiple impact marks document the cleaving of massive long bones. Cortical bone fragments from limb bones and ribs were preferably used as raw material for tools. The skeletal representation of the carnivores, and the cut mark and breakage pattern observed on their bones indicate skinning activities as well as consumption of the meat. Wachtberg is an area on the outskirts of the major city of Krems on the Danube. The Krems-Wachtberg site is situated on an exposed south-easterly slope, at a height of 260 m a.s.l., within a cluster of Aurignacian and Gravettian sites. The topography is characterised by a hilly area with upland ridges with a base altitude of c. 500 m a.s.l. and peaks at c. 1000 m, and valley floors at c. 200-190 m a.s.l. In summer 1930 the chance discovery of bones within the loess sediments was followed by a short rescue excavation. The most striking feature within the small site of c.15 square meters were two ditches c. 30 cm in depths filled with ashy sediments (Einwögerer 2000). The archaeological inventory comprises the oldest, and up till now the only two zoomorphic burnt clay figurines from Austria. The stone artefact assemblage yields c. 2 300 finds including 70 tools and over 500 bladelets. Their morphology shows strong affinities to lithics from the Moravian sites of Dolní Vestonice and Pavlov, which are located approximately 100 km away. Charcoal was determined as dwarf Pinus sp. and Abies sp (Cichocki 2000). AMS-dates (27,7–27,1 ka BP), the presence of clay figurines, and the stone tool analysis closely resembles assemblages assigned to the “Pavlovian” culture (for example Klíma 1965, Svoboda 1996). The bone sample comprises c. 340 elements and fragments. The archeological documentation did not include a complete inventory of all recoverable bones (Fladerer 2001, in press). The bone surfaces are corroded and destroyed by root etching, and only the deepest parts of cut marks made by humans are preserved (Fig. 4). Fig.1 - Age structure of eight mammoths from the Krems Wachtberg, 1930 excavation. Dark shaded area in age class I indicates proportion of nursing calves, younger than two years. Individual count vertically, age classes and year intervals horizontally (after Haynes 1987) (from Fladerer 2001). (Figs. 1-2). In addition two smaller individuals (older juveniles or young adults (females?)) can be recognized from postcranial material. The diaphysis of a femur of a small subadult individual, and part of an articulated anterior left foot represent individuals 5 and 6. At least one animal older than individual 6 and younger than the adult male is represented by the metapodials. This subadult (individual 7) may have died between 16-26 years. A right tusk (187 cm in length) represents a bull mammoth. Amongst the postcranial material adult individuals could be identified from several rib fragments, and several cortical limb bone fragments. These bones could belong to the putative bull (Fig. 3). The presence of parts of the head, such as skull and jaw fragments indicate dismemberment of the head during an advanced stage of butchering. In the case of at least one of the calves and the subadult individual 6, heads have been transported to the camp. Foot bones of calves and adult individuals occur in the living-floor assemblage and are evidence of the removal of the feet at the death site (Fig. 3). Carpals, tarsals and phalanges are common elements at regional Upper Paleolithic residential sites (Fladerer 2001). 4. Mammoth Bone Identification and Bone Use. Impact notches on several long bones represent the most striking form of modification at the Krems-Wachtberg site (Fig. 3). Multiple notches can be observed on the 43 cm long proximolateral fragment of a femur. At least eight impacts are aligned on the caudal face of one of the longitudinal fracture edges. Approximately 15 cortical bone fragments attest to the fracturation of long bones and ribs. The modification of the lower mandible of juvenile mammoth 4 with its missing teeth and mandibular arches is worthy of particular notice. The left alveolus of the third milk molar and the first permanent molar are filled with a grey ashy material. 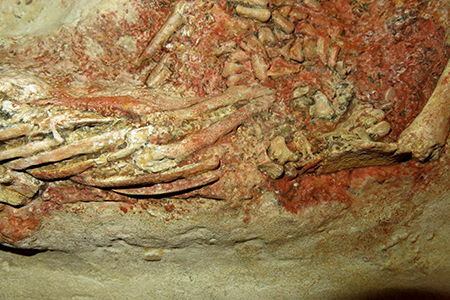 The base of the concreted ashy filling in the cavity has been exposed during excavation or in the course of the following 60 years due to damage of the mandibular bone (Einwögerer 2000). The morphology of the convex base is regular and does not dispay the irregular surface that would usually be observed on the negative of a base of the filling of an alveola. A modification of the jaw by palaeolithic humans is also strongly suggested due to the lingual edges of the first molar. Both sides show symmetrically destroyed (and later corroded) lingual walls, and the molars were apparently intentionally removed. Some tusk fragments show modifications which are also interpreted as produced by humans (Fladerer 2001). Cut marks are preserved on six out of a total of 110 specimens, and occur on ribs and cortical bone fragments (Fig. 4; Fladerer 2001). Fig.2 - Individual ages at death of four nursing mammoth calves as suggested by dental development, attrition, and replacement according to Laws (1966; see also Saunders 1992) and G. Craig (in Haynes 1991). Asterisk: hypothetical date of birth. Light shaded area: possible span of individual tooth-age. Short dark bar at the top indicates a possible common death season for all four individuals in the early winter months (November/December). From Fladerer (2001), modified. Fig.3 - Body-part representation of mammoths (shaded). Numbers in parentheses indicate the minimum number of individuals counted on each element. Short arrows in bold face: impact marks. Long narrow arrows: cut marks. White arrows: breakage probably resulting from a heavy blow. Outline after Mol & Essen (1987). From Fladerer (2001). Bones were utilised and modified as tools: (1) A compact bone fragment (134 mm long x 12,7 mm thick) was heavily reduced on the medular face by scar-like modifications. It was probably used as a core. (2) The distal fragment of an anterior rib with spongiosa exposed (maximum width of 57 mm) is comparable to spoon-like tools from Dolní Vestonice II (Klíma 1995). Both cranial and lateral edges, and the terminal-ventral edge are polished by use. (3) A fragment of a caudal rib (165 mm in length) displays reduced cranial and caudal edges along the dorsal part of its preserved length, and a distinct terminal-ventral smoothing. This find compares with flesher-like or polisher-like implements shown, for example, by Klíma (1995). (4) A broken juvenile rib (65 mm in thickness) has been smoothed terminally comparable to find no 3. (5) MK 1047 is a multiple retouched spindle (bobbin)-like tool made from a cortical fragment of a long bone (Fig. 5). The flat fragment (18x5x1,5 cm) is terminated proximally and distally by transverse fracture edges. One side is dominated by a large longitudinal spiral fracture lending a blade like appearance to the find. The opposite side is primarily modified by three impact notches, two of which were directed to the outer side of the bone producing a bifacial modification. At least three additional smaller notches have produced a scalloped edge. Polish within the notches also suggests utilisation of the tool as a flat spindle (bobbin). A few additional fragments, mainly from ribs and thick cortical long-bones, with flake scars, support evidence of the importance of mammoth remains as a main source of raw material for the Pavlovian people. Rangifer tarandus, Capra ibex, and Cervus elaphus which are the most important prey species for the regional middle Upper Palaeolithic (e.g. Musil 1959; Fladerer 1996; West 1997), are represented at Krems- Wachtberg by only a few limb fragments and pieces of antler. The total of 14 carnivore individuals (Canis lupus: 6, Vulpes vulpes: 4, Alopex lagopus: 1, Gulo gulo: 3) in the sample represent over 50 % of the total MNI. Articulated bones provide evidence of the deposition of carcass parts enclosed in soft tissues and/or a rapid burial of the finds. This evidence together with impact notches documenting the opening of the medullar cavity along with cut marks produced during filleting can be observed on bones of both herbivores and carnivores. The skeletal representation and modification patterns (in terms of cut marks and impact notches) of the bones of the four species of carnivore do not significantly differ from one another (Fig. 6). They document stages of carcass processing indicating additional utilisation of the carcasses, probably as a source of food. Some ritual meaning in the abundance of carnivores at Central European Late Paleolithic sites is postulated by Fig.5 - Krems-Wachtberg, bobbin-like bifacially worked cortical bone tool made from mammoth bone (MK 1047), left: external view, middle: centre, right: internal view. Fig.6 - Percentage of the observed elements of wolves (Canis lupus) and foxes (Vulpes vulpes, Alopex lagopus) vs. the expected number after the minimum number of individuals (Fladerer 2001). Soffer (1993). However, since the documentation of the excavated living floor at the Krems- Wachtberg site is very poor, primary location and individual orientation of the bones necessary to test such a hypothesis cannot be reconstructed. Due to the state of preservation and the presence of articulated bones, a rapid natural embedding, or burial by humans, is indicated for the bulk of the faunal remains. Evidence for preserving, collecting and occasionally the selection of bones from anatomically similar positions, along with the burial of carnivore carcass parts, has also been recorded at other Pavlovian residential sites with zoomorphic figurines (e.g. Dolní Vestonice, Absolon 1938). The common occurrence of anatomical units of the carcasses, evidence of significant carnivore activities, and no obvious differences in the weathering stages within the assemblage, suggests that an attritional mammoth death structure from a time-averaged background is unlikely. Evidently, the sample contains selected parts of a local mammoth herd, which is biased towards juvenile individuals. Juvenile mammoths argue against long-term stress within the Middle Danube mammoth population at 27 000 BP since healthy modern elephant populations contain at least c. 30% juvenile and subadult animals (Haynes 1992). In a generalized analogy, the Krems-Wachtberg sample represents at least a group of four nursing females and their calves, which may indicate a herd of up to 20-40 mammoths. The skeletal representation pattern indicate transportation of head, back, and foot parts, as well as long bones and ribs from the death site. Cut marks are concentrated on rib surfaces. Multiple impact notches document the cleaving of massive long bones, sometimes used for bone tool production (Fig. 5). At least one male may have been part of the mixed herd, or this animal may derive from a separate foraging event. Communal targeting of a complete family group, as suggested by Saunders (1992), seems plausible. The landscape around Krems provided a variety of settings where animals could be ambushed. Several animals may have been ambushed during seasonal migration. Similar hunting methods were probably used at sites in Southern Moravia (e.g. Klíma 1995, Svoboda 1996), which were partly occupied in the summer. 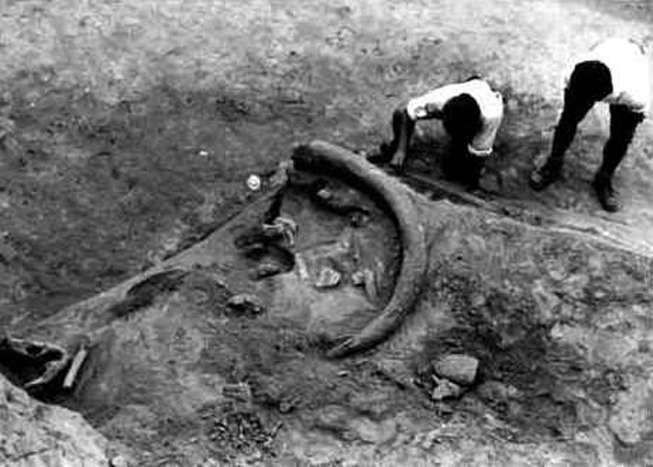 This is indicated by the remains of neonate mammoth calves at several sites in the Middle Danube region. The site of Krems- Wachtberg, was probably occupied during the first months of the winter as deduced from mammoth calf demography (Fig. 2). This interpretation of the season is in accordance with the great volume of ashy deposits within the excavation field. Furthermore the exploitation of animal fur, and evidence for the extraction of marrow is economically important between autumn and mid-winter when the animals are in a prime condition. In terms of complex subsistence settlement practices, it is suggested that a pattern of communal hunting of mammoth in particular functioned from seasonally aggregating camps during the Upper Palaeolithic period in the Middle Danube region. Researchers have unearthed the graves of three Stone Age infants that may ultimately bear on the question of whether humans interbred with Neanderthals. The rare find, from a 27 000 year old site in Austria, includes two bodies that might be twins sheltered under a mammoth's shoulder blade. The team discovered the skeletons in two separate burial pits: One uncovered in 1995 contained two infants side by side - twins, apparently. A second pit containing a single body was found in 1996 about a metre from the first pit. The twins had been protected from the elements by the mammoth bone and were very well preserved, says team member Christine Neugebauer-Maresch of the Prehistoric Commission of the Austrian Academy of Sciences in Vienna. An incisor from one of the pair indicates they died at nine or ten months of age, the group reports in the November 16 Nature. Before this, "there were no graves of newborns at all," Neugebauer-Maresch says. "We think if there are two preserved it's possible there are much more." Numerous traces of burial practice survived. 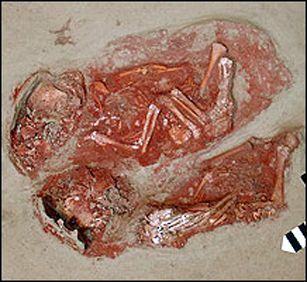 All of the infant remains were covered in red pigment, and more than 30 ivory beads lay near the pelvis of one of the presumed twins. The lone skeleton contained an ivory pin, which may have held shut a leather or fur wrapping, Neugebauer-Maresch says. The excavators found the remains in an 18 square metre site in lower Austria, near where the river Krems meets the Danube. The location contains a well preserved earthen floor and other artefacts characteristic of so-called Gravettian culture, including a fired piece of clay bearing a human fingerprint. These twins were brought into this world for just a short time. Only a few days after birth their souls went back to the shades. All life is precious. On the mammoth steppe all life is interconnected. Life follows death follows life: it is a never ending cycle. Nothing and nobody goes into oblivion. The dead are decorated with individual objects, and are buried in the earth consecrated by red ochre. Even newborns are of course part of that life cycle. Every living thing is precious. The dead infants were buried with jewellery, coated in a powder of red ochre, and wrapped in a blanket. A mammoth shoulder blade covered their resting place, preserving it for posterity. Krems, Austria, about 32 000 years old. Close up of part of the burial. The rules of society arranged not only the daily lives of the living, but also dealt with the dead. The dead were not separated from the living but usually buried in the settlements, covered in red ochre, and often richly decorated with valuable items. The burials reflect the place of the people in their social community. In addition to the carefully arranged, ostentatious graves, there often lie with them, seemingly carelessly deposited in the same burial, body parts of others: relics of unknown rites and customs. The second of two burial sites discovered in Austria contains a single Stone Age newborn. 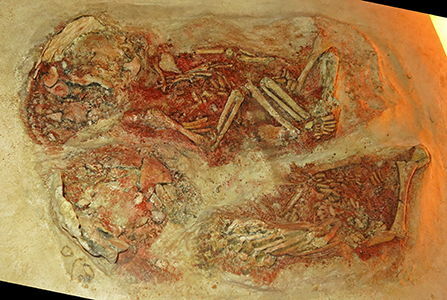 The infant burials were similar to those for Gravettian adults, whose remains often include mammoth bones and jewellery, says anthropologist Olga Soffer of the University of Illinois at Urbana-Champaign. "What is unusual is the extreme youth of these," she says. "Dead kids are few and far between, and the younger you get the fewer there are." The effort taken to bury and decorate the remains implies the infants or their families were held in high esteem, she notes. Studying the Austrian infants or any DNA extracted from them may contribute to the debate over whether or not humans and Neanderthals exchanged DNA, Soffer says. In recent weeks researchers have presented evidence that humans and Neanderthals interbred when humans left Africa 30 000 - 40 000 years ago. Human skeletons found in Romania seem to show certain Neanderthal traits, for example. The new remains could be examined for similar features, Soffer observes. "It will always be a little problematic because they're not mature, but it will be an important point of reference," she says. "There's lots and lots of exciting potential here." United ... these babies were born 27 000 years ago. 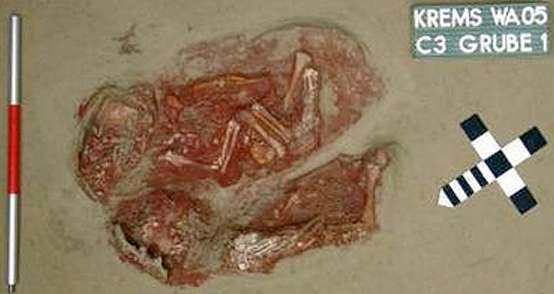 The 27 000-year-old skeletons of two Ice Age infants have been found near Krems in northern Austria, the first discovery of its kind in Europe, Austrian media have reported. The perfectly preserved skeletons, measuring 40 centimetres, had been protected by a mammoth's shoulder-blade, under which they had been buried on a sheltered hillside on the banks of the Danube. The grave, discovered 5.5 metres below ground, also contained a necklace of 31 beads made from mammoth ivory and was located next to an area inhabited by the ancient humans Homo sapiens fossils , newspapers reported. "It is the first discovery of a child's grave dating from this period," the excavation manager, Christine Neugebauer-Maresch, confirmed to the newspaper Kurier . "They may have been twins, but we have not yet been able to establish that," she told Die Presse . The age of the skeletons will be analysed by scientists in Vienna, who will also determine the cause of death. Homo sapiens fossils came out of Asia during the Ice Age as Neanderthal man was dying out, and mastered stone and wood, but did not discover metal. 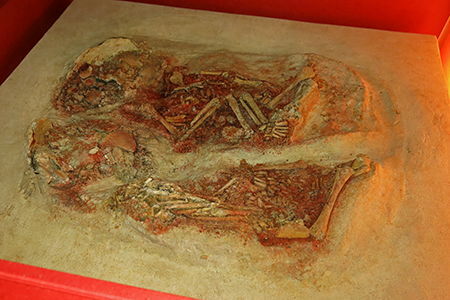 A more than 27 000 year-old grave with the bodies of two babies is pictured near Krems in Lower Austria September 23, 2005. Archaeologists of the Prehistoric Commission of the Austrian Academy of Sciences (OeAW) excavated the bodies which were covered with an omoplate (scapula, shoulder blade) of a mammoth. This is the oldest grave ever found in Austria. Mit einem sensationellen, eiszeitlichen Fund können Archäologen der Österreichischen Akademie der Wissenschaften aufwarten. Sie entdeckten auf dem Wachtberg bei Krems eine mehr als 27.000 Jahre alte Begräbnisstätte. Im Grab fanden sich die mit Grabbeigaben versehenen Skelette von zwei Säuglingen, möglicherweise Zwillinge. "Sie wurden liebevoll unter einem Mammut-Schulterblatt bestattet", erklärte Projektleiterin Christine Neugebauer-Maresch gegenüber der APA. Im Raum Krems finden sich teilweise meterhohe Auflagerungen von Löss - ein sehr feines Staubsediment, das ursprünglich aus Flüssen stammt. Immer wieder entdecken Archäologen darin Kostbarkeiten aus der Eiszeit: So kam vor 17 Jahren die unter dem Namen "Fanny" bekannt gewordene steinerne Statuette bei Ausgrabungen in in Krems-Rehberg und Stratzing ans Tageslicht. Bereits seit mehreren Jahren sind die Archäologen der Prähistorischen Kommission der ÖAW auf dem Wachtberg von Krems mit Unterstützung des Fonds zur Förderung der Wissenschaftlichen Forschung (FWF) tätig. Trotz einer Tiefe von über fünf Metern konnte so das Areal eines Behausungsplatzes geortet und gezielt als Forschungsobjekt ausgewählt werden. Die Funddichte übertraf laut Neugebauer-Maresch alle Erwartungen. "In der etwa acht bis 15 Zentimeter mächtigen Kulturschichte mit einem Alter von rund 27.000 Jahren konnten auf bisher rund zehn Quadratmetern mehr als 10.000 Fundstücke dokumentiert und geborgen werden", berichtete die Wissenschafterin. Glanzstücke sind eine besonders feine Steinsäge, bearbeitete Klingen, Kratzer, ein feines Elfenbeinstäbchen und ein geformtes und gebranntes Tonobjekt. Mitte September stießen die Archäologen dann auf eine Vertiefung unter der Kulturschicht, die durch ein Mammutschulterblatt abgedeckt war. Darunter fanden die Ausgräber eine mit rotem Farbstoff aufgefüllte Mulde, an deren Grund die zarten Knochen zweier Säuglinge lagen. Beim weiteren Freilegen der Skelettteile entdeckten die Forscher noch eine Kette aus Schmuckperlen. Dies ist für Neugebauer-Maresch ein weiterer, klarer Hinweise für einen Bestattungsritus, die Kette war offenbar den beiden Verstorbenen mitgegeben worden. Die Funde gelten nun als mit Abstand älteste Grabstätte Österreichs, die ersten Belege für Bestattungen aus der Eiszeit. 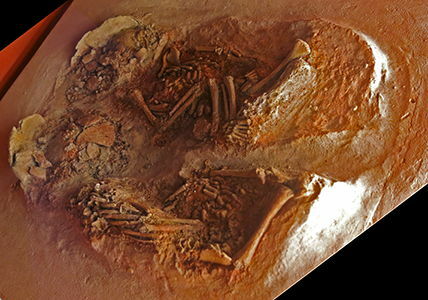 A burial site 27 000 years old has been discovered at Krems. 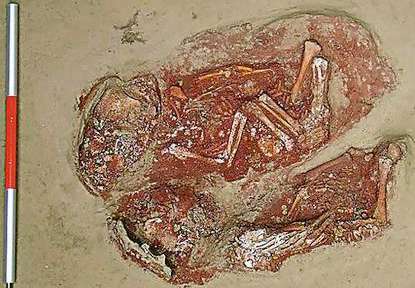 It is a sensational ice-age find by archaeologists of the Austrian Academy of Sciences. In the grave were skeletons of two babies who were possibly twins. "They were affectionately laid to rest under a mammoth shoulder blade", said project chief Christine Neugebauer-Maresch from the APA. 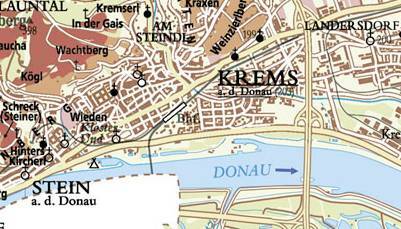 In the Krems area are sometimes metre-deep deposits of Loess - a very fine dust sediment, which originates from rivers. In this area archaeologists have discovered many important finds from the ice age: Thus "Fanny", a stone Statuette also known as Venus vom Galgenberg was unearthed in Krems Rehberg and Stratzing 17 years ago. For several years the archaeologists of the Prehistoric Commission of the OEAW Wachtberg bei Krems with the support of the fund have been active for the promotion of scientific research (FWF). Despite a depth of over five metres a dwelling place was located and selected as a research project. The density of the finds exceeded all expectations according to Neugebauer-Maresch. "in a layer about eight to 15 centimetres thick a vigourous culture approximately 27 000 years old was documented and preserved, and in approximately ten square metres more than 10 000 artefacts were found", reported the scientist. Amongst the gems found were a particularly fine "stonesaw", processed blades, scrapers, a fine small ivory rod and a ceramic object. I have no idea whether the following is a correct understanding of the term "stonesaw", but I include it for general information in any case. I collect useless information, and it doesn't come more useless than this - which is precisely why it is both useful and instructive! Most people are familiar with stone axes and celts for cutting down trees. In central California neither of these tools are found in the archeological record, and most of the houses built were framed with relatively small diameter trees (1 - 3 inches). My experience of trying to cut down springy willows with a stone axe led me to believe there must be a better way. After asking local archaeologists to no avail, I called Craig Bates, Curator of the Indian Museum in Yosemite, who told me about the historic use of a stone slab as a crosscut saw. Later I found documentation describing a group of four Indian men cutting down a tree. Two men used their carrying nets hooked together to catch and bend down the tree, the other two used a stone slab as a saw to cut the tree in about a minute. Working alone, I found it took me three to five minutes to cut down a willow 1.5 - 2 inches thick, bending it over with one hand and cutting with the other. The entire tool kit used to create the shelter frame: Abalone shell, basalt flakes, obsidian chopper, wooden maul, and hafted saw. Then, with a group of volunteers, I set out to cut down a dozen 2 inch diameter willows for house poles. Using the hafted saw, we could cut down a tree in just over a minute with four people as in the ethnographic account. Other members of the group created some crude edged tools that we also tried. These took about three minutes or so, because of the difficulty in holding onto them. Some trees took longer simply because of their position, and the difficulty of getting them properly bent over. The largest size that would be practical to cut seems to be about 3 to 4 inches in diameter, at which size an axe begins to work more efficiently. The stone saw works only on green wood, and only when the tree is bent over sharply. This allows the saw to cut without side friction and jamming. It cuts about an eighth of an inch per motion. If proper pressure is not applied to the base of the tree, a series of splits will form in the end of the piece. Pushing down on the end above the cut moves the splits down to the stump, or eliminates them altogether. When the position of the tree permits, it can be cut half way through and then bent back the other way for a final cut. Where the second bend was not practical, I found I could cut most of the way through and then simply stomp down above the cut and peel it away from the stump, or pull up on the pole and peel it away. Smaller poles for binding on the thatch took about 30 seconds to cut. The saw's efficiency was quite gratifying to all of us, as we got our poles cut and carried them back to the building site in about two hours, less than the time it would take me with a steel saw working alone (hauling would take longer). In the middle of September the archaeologists encountered a recess under the culture layer, on top of which a mammoth shoulder blade was placed. Beneath it the excavators found a hollow filled up with red colouring material, covering the bones of two babies. When examining the skeletons the researchers discovered a necklace made of decorative beads. This is a further, clear reference for Neugebauer-Maresch for a burial rite, the necklace had obviously been given to both deceased. 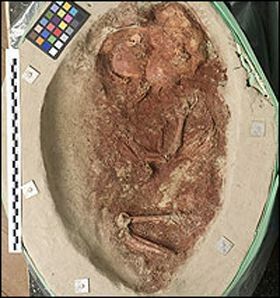 The findings now show Austria as having the first records of burial in the ice ages. 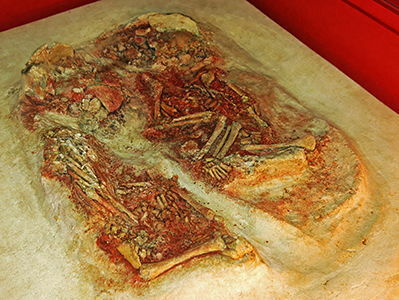 The twins were buried side by side covered in red ochre (Image: Austrian Academy of Sciences) Two ice-age human infants, buried together with great ceremony, have been discovered on a hillside overlooking the Danube in Austria. The pair, who may well be biological twins, were found near Krems in northern Austria by Christine Neugebauer-Maresch of the Austrian Academy of Sciences and her colleagues. The remains have yet to be carbon-dated but are thought to be at least 27 000 years old, because other artefacts from the area have been dated to between 40 000 and 27 000 years old. During this period, which falls within the Upper Palaeolithic, Neanderthals were superseded by modern humans, who were developing increasingly sophisticated hunting abilities and forms of culture. The babes were placed side by side in their grave and protected beneath a woolly mammoth's shoulder blade, which was propped up by pieces of mammoth tusk. The bodies were wrapped in a material such as animal hide that has since deteriorated and were covered with ochre. Neugebauer-Maresch told New Scientist that more than 31 ivory beads were also found at the burial site. "They had been buried with much ritual - it is really very interesting," she says. Structural remains The "twins" were found on 21 September 2005 at a depth of five metres after speculative drilling of cores within a wider area had already yielded many structural remains and stone artefacts. These are, however, the first human remains to be found at the site. The pair has been moved to Vienna's Natural History Museum, where they will be examined further and carbon-dated by Maria Teschler-Nicole. She will place the remains within a chamber with controlled humidity in order to limit further deterioration. Teschler-Nicole has already found that both babies' femurs measure 71 millimetres in length, which suggests they were newborn and also that the pair were related. "The probability that they are twins is high," she told New Scientist . "But we can't prove it without DNA or teeth fragments." She says there may be insufficient organic material to extract useful DNA from the pair.